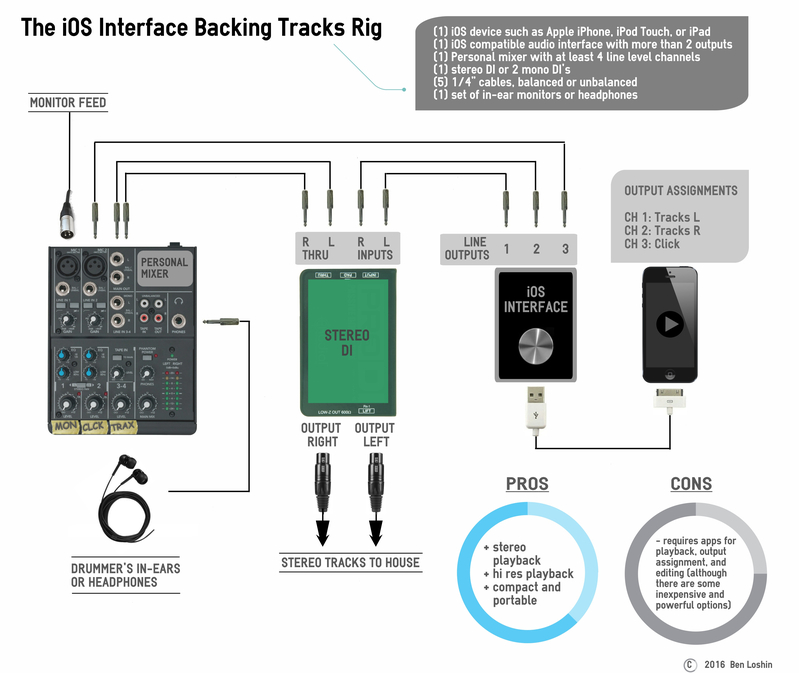 What if you love the idea of running your backing tracks from your iPhone, iPod Touch or iPad, but you need your tracks to play in stereo and sound really good? The headphone jack on your iOS device can be a great option in a pinch, but it only puts out 1 stereo track (or 2 mono tracks if you utilize a splitter). You need an external soundcard, also called a digital-to-audio converter (DAC) or external audio interface. In the past few years lots of companies have introduced audio interfaces for the iOS device to the market. Many of them have 2 outputs, and that’s fine if you want to run mono backing tracks. However, if you need to send a stereo backing track to the house AND a click track to yourself, that puts you at 3 output tracks. My favorite iOS interface at the moment is the Native Instruments Traktor Audio 2. I love the Traktor because it’s super compact (fits in the palm of your hand) and super affordable ($100 retail). Though it’s geared toward the DJ market, the Traktor does have two independent 1/8” TRS outputs, for an output track count of 4. One limitation to the Traktor is that it has no audio input preamps or analog-to-digital conversion. In other words, you can’t record with it; strictly playback, but for running backing tracks, that’s all we need in order to get the job done. If you want to purchase something you can also use for recording, the Apogee Duet is a great option. You’ll also need an iOS app that allows you to assign your stereo mix and click to separate outputs. ShowOne by One Zero One Audio is a fantastic app designed specifically for playback of mono or stereo backing tracks and click/cue tracks through separate outputs. At only $8.99 for the full version it also comes with a bunch of really handy features like automatic click track syncing, voice countoffs, and setlist management. Prepare your backing tracks within your playback app so that you have a stereo mix and a click track routed to individual outputs. Use outputs 1 and 2 for the left and right sides of your stereo backing track and output 3 for click. Connect your iOS device to your interface. Some interfaces may require adapters from Apple 30-pin to Apple Lightning. Run a ¼” balanced or unbalanced cable from Output Channel 1 on your interface to the input jack on the stereo DI box labeled “Left”. Run a ¼” balanced or unbalanced cable from Output Channel 2 to the input jack on the DI box labeled “Right”. Run a ¼” balanced or unbalanced cable from the left thru port on your stereo DI to the left side of a stereo channel on your mixer labeled “Tracks”. Run a ¼” balanced or unbalanced cable from the right thru port on your stereo DI to the right side of a stereo channel on your mixer labeled “Tracks”. Run the ¼” balanced or unbalanced cable from Output Channel 3 on your interface to a channel on your mixer labeled “Click”. Introduce yourself to the sound guy/gal or monitor engineer and politely ask for a feed to plug into the channel on your mixer labeled “Mon”. Make him/her aware of your DI’s for stereo front-of-house playback. Connect your in-ear monitors or headphones to the headphone jack on your mixer. Put your device in airplane mode when using it for playback. If your interface uses TRS outputs to combine pairs of output channels (the Traktor Audio 2 does this), use a stereo “Y” cable to split these channels instead of the two ¼” cables in steps 3 and 4 above. Some interfaces are bus powered, meaning they use your iOS device as a power source, and they will thus drain your iOS device’s battery very quickly. So make sure you use an external DC power supply to power your interface.